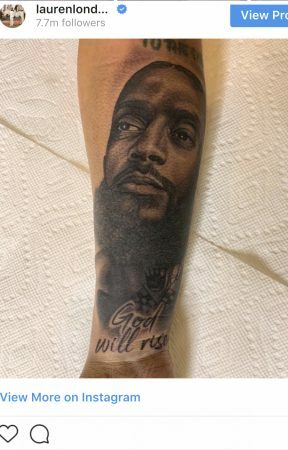 Hours after Nipsey Hussle’s “celebration of life” memorial service on April 11, 2019, 34-year-old actress Lauren London, Hussle’s girlfriend revealed on Instagram a new tattoo of the face of Hussle she had inked on her arm. Under the large Hussle tattoo, she wrote “God Will Rise.” Hussle had that phrase tattooed right next to his right eye. 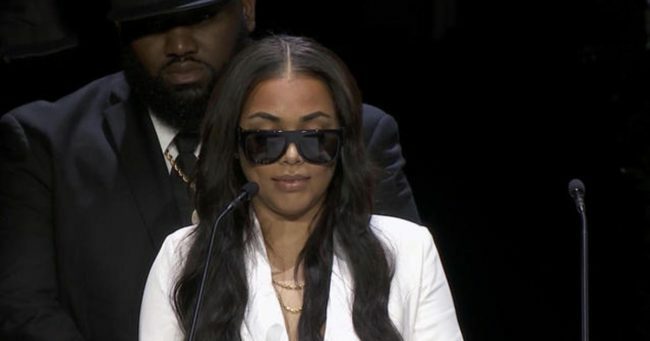 London spoke at the ceremony which took place at the LA Staples Center which was filled by 21,000 people that Hussle was the love of her life. London is not the only one who tattooed Hussle onto their bodies. Rapper The Game and NBA basketball player JR Smith had Hussle’s face inked on them. Former President Barack Obama, Kanye West, and Drake all spoke about Hussle’s death. Donald Trump did not comment. Hussle and London were together for six years and had a son, Kross who is 2-years-old. Hussle also has a daughter Emani Asghedom, from a relationship to Tanisha Asghedom. London has a son with Lil Wayne named Cameron Carter who is nine years old.